STAR (Sustainable Terrain And Resources) Island resort, a 35-acre cay located off the northern coast of Eleuthera, has partnered with Tropic Ocean Airways for up to eight guests to travel to the resort's remote location by chartered flights. FORT LAUDERDALE, FL (PRWEB) May 09, 2017 – STAR (Sustainable Terrain And Resources) Island, a 35-acre cay located off the northern coast of Eleuthera, Bahamas, is using off-grid technology to produce its own clean solar power, drinking water and organic food, while showcasing the latest green architecture to its guests. Tropic Ocean Airways is now the resort’s exclusive airline partner and the optimal option for travel to the resort’s remote location. Up to 8 guests will have the opportunity to charter a factory new Cessna Grand Caravan seaplane directly to STAR Island from multiple locations throughout South Florida, including Fort Lauderdale, Miami, and West Palm Beach. The airline’s fleet of late model seaplanes are the most fuel efficient models to date. Tropic Oceans’ history of involvement in the community and environment improvement efforts, includes but is not limited to, donations to the Bimini Shark Lab, hurricane relief efforts in The Bahamas, and continuous support and sponsorship of local charity events that benefit research and development of marine ecosystems. At this time guests to the island will be able to begin their trip with a low-elevation sightseeing tour of the island and a water landing at the resort. The first working prototype on the island, The Beach Bar and Grill, is already open and offering visitors lunch made from local ingredients right from the garden. From there, they will be able to choose from activities such as bone fishing, kayaking, paddle boarding and snorkeling. Guests can also book the island for weddings, family gatherings or corporate outings.STAR Island’s first overnight stay unit called “The Nest” will be open to guests by the end of May 2017. The room is above The Beach Bar and Grill and includes two balconies so guests can have multiple viewing areas of the island. Tropic Ocean Airways is the Eastern United States leading seaplane travel company that offers private charter, scheduled service and cargo services throughout South Florida, the Florida Keys, Bahamas and beyond. The FAA certified air-carrier was founded by Navy TOPGUN fighter pilot Rob Ceravolo in 2009. Since inception, the safety measures have awarded Tropic, the ARGUS gold rating for safety, a perfect record of zero FAA violations and a 5-star rating on TripAdvisor. The premier company has its own in-house maintenance team and facility, along with pilots who bring over 100+ years of combined flying experience in harsh and tropical weather conditions, who work together to deliver the highest level of first-class customer service during each flight. The factory-new seaplane and wheeled caravan aircraft can perform water-based, or runway landings and departures, making Tropic the ideal choice for travel. For more information, contact Alina Gavrushenko, Director of Marketing at 800.767.0897, extension 122, or via email at media(at)flytropic(dot)com visit us: flytropic.com. S.T.A.R. stands for Sustainable Terrain And Resources. It is a private destination using off-grid technology to power the entire island. Offering desirable and unique experiences to visitors, while caring for the environment and educating people about real possibilities in sustainable development. 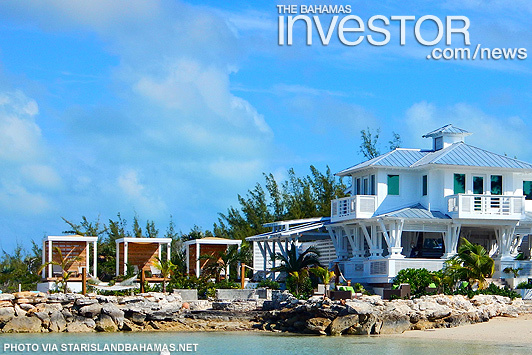 For more information visit starislandbahamas.net. Prime Minister Perry Christie has made a statement congratulating FMN leader Dr Hubert Minnis on his victory in the General Election yesterday. Read the statement here. Prime Minister of the Commonwealth of The Bahamas Dr Hubert Minnis was sworn in May 11, 2017, saying that the election result represented "a new day" for country.